Can I block spam referral URLs in Google Analytics? Referral spam occurs when your website gets fake referral traffic from spam bots and this fake traffic is recorded by your Google Analytics. Spam bot traffic can significantly skew your Google Analytics data, so for the most accurate GA results, you'll want to filter (block) referral spam. Our dashboard imports data from Google Analytics, and displays it in an easy to read and easy to comprehend format, as well as to allow you to aggregate the GA data with data from other sources so that you can present it in an understandable way to your customers. Outside of those features, we provide very little in the way of options for manipulating your Google Analytics data within our dashboard. As a result, if you do not want to see referral spam in the Agency Analytics dashboard, you'll need to filter it within your Google Analytics account itself, rather than in our dashboard. Step 1: Determine which referrals are spam. You can get a pretty good idea of which URLs are spam bots by sorting your referrals report within Google Analytics by bounce rate. Referrals with either 100% or 0% bounce rate and 10 or more sessions are generally spam. Step 2: Take your list from step 1, and confirm whether or not they are spam. You can first check them against this list of known spam bot referrals. If the URL is not on that list, you'll need to visit the referring website itself to check and see if it is spam. Be sure that you have anti-virus and anti malware software installed on your computer before visiting them. 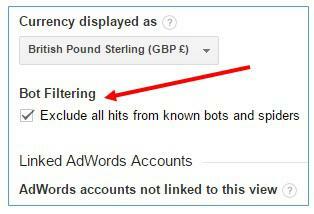 Create a custom advanced filter in Google Analytics. As these steps do not directly involve the Agency Analytics dashboard, the exact step by step process used to accomplish them are beyond the scope of what we can cover in a KnowledgeBase article. Much of the above information was pulled from the "Geek Guide to Removing Referrer Spam in Google Analytics" from OptimizeSmart.com. We highly encourage you to visit that link and read through the full tutorial, which DOES provide step by step instructions for the above suggestions. For even more information, please see this more technical but highly exhaustive guide to removing Google Analytics spam from AnalyticsEdge.com.